The measurement of static or low frequency deformations using piezoelectric strain gauges is an engineering challenge. A piezo electric strain gauge can generate a charge proportional to strain. This charge will dissipate in a relatively short period of time due to the finite input impedance of many of the used data acquisition circuits. Smart Material has revisited this problem with a new approach: the Store & Hold technique. 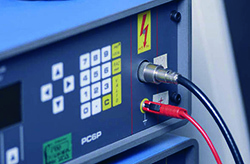 This transfers the generated charge to a high-end, leakage-free capacitor. The charge can be measured as a proportional voltage across the capacitance using a load-free, specially designed high impedance operational amplifier. This guarantees constant output signals of up to 3 minutes without any significant drift.